Sixteen Class 325 units were built for Royal Mail by ABB at Derby during 1995-96. They are technically very similar to the Class 319s, sharing the same traction equipment and body design, but are fitted with 'Networker' style cabs. Four cars made up each set, each car with 2 roller-shutter doors per side, and no bodyside windows. There are no gangway connections between cars. One non-driving vehicle has the traction equipment and has a pantograph to collect power from the 25kv AC overhead wires. The bogies at the cab ends also had shoes to pick up power from 750v DC third rail on the Southern Region. Maximum speed is 100mph. Unusually for modern EMUs, these units are fitted with conventional buffers and buckeye couplings at the cab ends, and are capable of being hauled by locomotive without requiring translator vans. When self propelled, the Westcode 3 step brake system is used (in common with other second generation BR multiple units) but when loco-hauled, the brakes are applied and released by means of the conventional distributor fed twin pipe system. The individual vehicles within each unit are coupled by a semi-permanent bar arrangement. The livery is Post Office red, with two yellow stripes running along the lower bodyside before turning sharply backwards and pointing up towards the roof, with yellow warning panels on the cab fronts. On the middle of the body side there are large Royal Mail logos. The livery of units 325004/005/006 feature Scottish Crowns in the Royal Mail branding and above the vehicle numbers. The other 13 units have English Crowns, and 'E.R. II' above the vehicle numbers. 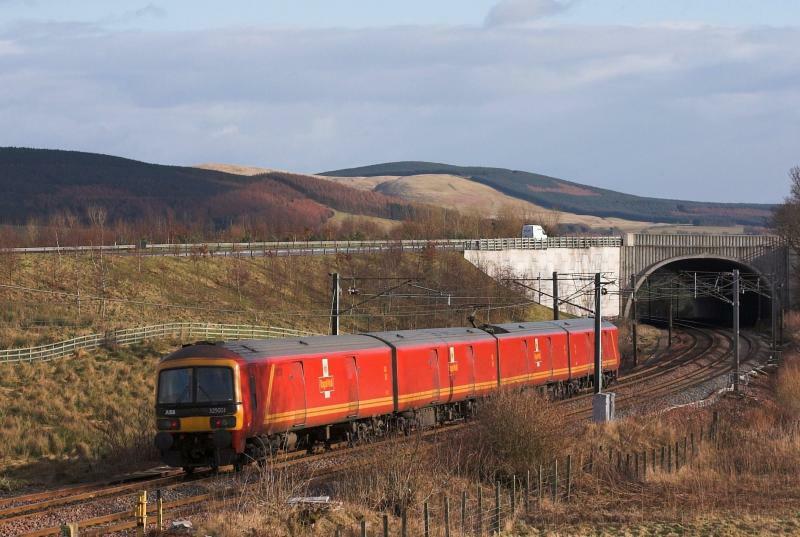 To mark the official opening of the Royal Mail Scottish Distribution Centre at Shieldmuir, on 8th October 1998 vehicle 68311 of unit 325006 was named 'John Grierson' after the Scot who pioneered documentary film making, including the classic 1936 film 'Night Mail'. The terminal had been brought into use on 16th February 1998. Initially the units were operated by Rail Express Systems (Res), which became part of EWS in 1996. In 2003 Royal Mail adopted a road/air policy and began winding down "Mail on Rail" and the units went into store. However in 2004 some of the units were reactivated for operation by GBRf which had been awarded some mail contracts. Initially the 325s were hauled up and down from London by class 87s. This dragging continued until there was enough motor coaches to cover the service. Class 87s can still substitute if needed but are normally dropped off at Warrington. Class 87s are now only used as backup and for driver refresher runs. Class 325s are sometimes used on the ECML as diversions from the WCML. As a result the occasional one sees driver refresher runs on this route. 325005 operated a driver training run between Shieldmuir and York on Wednesday 22 Novemeber 06. GBRf's contract expired in 2010. DB Schenker took over the Royal Mail rail operations and responsibility for managing the Class 325 fleet, in 2010. The units are occasional hauled by Class 90 locomotives. The fleet consists of 15 units numbered 325001 - 325016. 325010 was scrapped in March 2012. On 6th July 2005 GBRf hired 47200 from Cotswold Rail to haul 325005 on 1Z95 19:30 Shieldmuir - Aberdeen Guild Street, and 1Z96 11:30 return the next day. The train conveyed mail to Aberdeen which would normally go by air, but due to restrictions in force for the G8 conference at Gleneagles, it had to go by rail. On 16th March 2008, 47848 hauled a class 325 unit from Shieldmuir to Ayr, then back to Glasgow, for Driver training. On 13th February 2010, 66728 hauled 2 class 325 units from Polmadie to Fort William (4Z98), for Driver training ahead of GBRf taking over operation of North Blyth - Fort William ALCAN trains. Created by system and last modified by Dysgraphyk at 22:54, 10 of May 2014.